Enjoy premium comfort in a prime location at our newly renovated Shreveport, LA hotel. Courtyard Shreveport-Bossier City/Louisiana Boardwalk puts you by the areas top attractions. Stroll down the iconic Louisiana Boardwalk & take advantage of incredible shopping, dining & entertainment options held there. Our hotel near Shreveport Casinos puts you nearby some of Louisiana's top casinos such as the Horseshoe Casino, Margaritaville & more! Stay in complete comfort from check-in to check-out with guest rooms that feature room to spread out & make yourself at home. Our signature bedding experience is like sleeping on clouds with plush mattresses, cotton-rich linens & piles of soft pillows. Use the 24-hour fitness center to keep up with your active lifestyle & cool off in our outdoor pool. Start each day off right with a delicious breakfast, or enjoy our onsite restaurant, The Bistro. Offering an array of dining options for breakfast & dinner. We look forward to hosting you at our all new Shreveport hotel! The Bistro Eat. Drink. Connect. 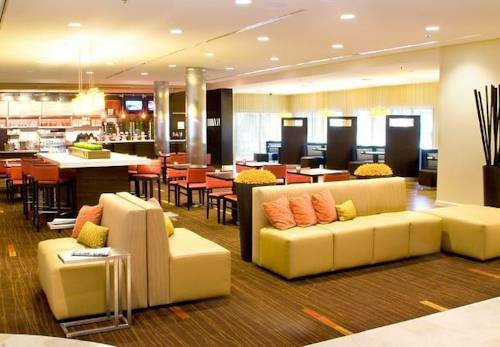 : Enjoy a variety of delicious options for breakfast & dinner at The Bistro, the in-house restaurant at our hotel in Shreveport-Bossier City! Have a refreshing beer or wine, or try one our specialty beverages made with Starbucks coffee!